I recently came across an interview where world number one sprinter Usain Bolt was asked why he was retiring from sprinting at the early age of 31. His reply was interesting in that he said that he had reached his goal, which was to win three Olympic Golds in three consecutive Olympiads. His last one was attained at Rio in 2017, and after that, he said that there was nothing to motivate him anymore, and it was all ‘downhill from there’. Surely, no one would begrudge him his well deserved accolade of being the fastest man on earth, with all the medals and titles he has achieved thus far in his illustrious career as a sprinter. But in that interview, you could sense that there was a shade of disappointment in his demeanor when he said that it was all ‘downhill’. He also did add that there was no longer any motivation for continuing to pursue goals in running. In the Christian perspective of life, as in the world of sport, motivation is just as, if not, even more important. What motivates us to live out our discipleship of Christ in and through our lives is something that we should always be contemplating and pondering while our journey towards heaven’s eternal joys is not ended. Even St Paul used for analogy the training for sports to convey this notion that it is akin to a race that we are running, but for a wreath that will not fade. For us Christians, the ‘race’ cannot be seen as one that has a ‘retirement point’, unlike Bolt’s running career. 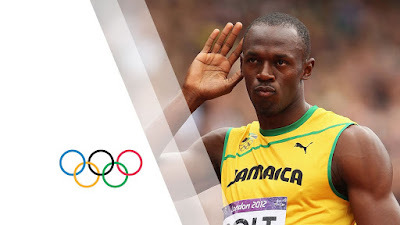 It is quite understandable that the mere physicality of Bolt’s craft depends very much on his physical fitness and muscle coordination ability. These are very much connected to and affected by one’s physical age and health, and it is just a matter of time when younger, fitter, and more agile runners become the ones who stand on the winner’s podium. It’s just that some world records are harder to break than others. So what is our motivation for our Christian lives? What is it about Christianity that doesn’t have a ‘reach-by’ or ‘use-by’ date? The ability to define this goal as clearly as possible will serve us well in that it will give us the reason to keep pursuing it constantly, with the grace of God. This goal is of course heaven’s eternal joys where as Revelations tell us, where God will wipe away every tear from our eyes, and there will no longer be any mourning, nor crying nor pain. What this also necessarily means that while we are in this life and part of the Church Militant, mourning, crying and pain are experiences that are inevitable for every single human being. Seen in a more positive light, these features of our human brokenness and imperfection are elements that make us long and yearn for not just our ‘moment in the sun’, but an eternity of being IN the Son. Extending from last week’s reflection on the fleeting nature of worldly success, setting our sights on a joy and a goal that is eternal and in the future is what prevents us from reaching a point of being jaded and lacking in motivation in our spiritual lives. We need to remind ourselves that if our goals and aims in life are greatly connected to the material, the tangible and those that can be measured in terms of titles, awards, accolades and possessions, we have set the bar too low. A goal that is heavenly and non-attainable in this life is a bar that is raised to such a level that no earthly recompense, honour and bounty can match. Catholic Christians are particularly advantaged in living with this goal because along the journey of this life, we are richly aided by God’s assuring presence and strength when we are given Sacramental grace. Each time we participate at Holy Mass, and receive Holy Communion in a worthy manner, we get a foretaste of heaven by the very fact that we receive in us the Body, Blood, Soul and Divinity of Jesus Christ, the Son of God made man. Regular participation in the Sacrament of Reconciliation keeps us grounded in humility and in a state of grace. God knows how challenging it is for us to be constantly motivated for our heavenly goal in the sea of the world’s challenges and the turbulent sea of temptations that come fast and furious at us. Receiving Jesus in Holy Communion is what strengthens not just our resolve, but above all, strengthens our faith in God’s constant love and presence in our lives. Many Catholics cannot make this important connection when they receive Holy Communion. Receiving the Eucharist is much more than just getting a shot of Holy Red Bull or some Sacramental Energy Boosting drink. I have heard the sad lament of many a Catholic who tell me that they wish they had a personal encounter with Jesus, and my response to them is that the Eucharist is precisely this. In the Eucharist, God is giving each person a truly personal encounter. Which friend do you know would say to you “I love you so much that I want to give you my flesh to eat so that you and I can have a deep bond established”? Probably not a single friend can say this. Yet, God has said this, and is constantly saying this at every Eucharistic celebration. Being ignorant of this and unappreciative of this results in what we see these days – thousands and thousands of Catholics forming long lines to receive Holy Communion at Masses throughout the world, but with scant attention paid to what is truly taking place – a dynamic and real encounter that goes way beyond personal between Jesus and the communicant. Being incognizant of this truth is what probably make us think, erroneously of course, that we are left on our own in this life as we make our individual ways toward God in our daily lives. What we fail to appreciate is that Holy Communion is what can truly take the travail out of our earthly travel. As far as his running career is concerned, Usain Bolt is clear that it is ‘all downhill’ from here after his three Olympic Gold medal win. For Mr. Bolt’s sake, I hope that he has other goals to keep him motivated in life, because though medal- chasing may have an expiry date, there are aspects of life that don’t. As, Christians, our race for the finish is far from over. See you at the finish line! "...if our goals and aims in life are greatly connected to the material, the tangible and those that can be measured in terms of titles, awards, accolades and possessions ..."
I'm a recently retired Cath academic. As I cleared my office of copies of my journal and conference publications (which are now obsolete), it dawned on me that I had been expending a great proportion of my time and energy in furthering my academic career; not that this is bad in itself. The question I asked myself then was "So what now?" as I gingerly tossed printed paper after printed paper into the bin. God bless and prosper your ministry. Ronald Rolheiser’ s - The Restless Heart.......all seems to point to what you have mentioned ( in your previous post) that our deepest longings cannot be answered and assuaged by all the fleeting joys , tangible successes and pleasures of the material world. After the Cloud Nine experience Usain Bolt is down - sans motivation. How are we as Christians any different…. how are we motivated? I feel that motivation has to be fueled by a fierce or deep faith-passion, a desire that propels one into action, usually in a direction towards change, towards a goal….a long-term eternal goal. You have aptly reminded us how God’s grace has amply provided for us to keep us motivated till the end, through the Sacraments -especially the Holy Eucharist and Reconciliation and of course through His Word. Reflecting more on this, I feel that this faith-passion is founded on the awesome-reality and experiential knowedge of God’s love for us. It is this realization that makes people like St Paul seem so crazy when he says in Philippians 1:21 “ For me, to live is Christ……….” and his motivation was just living for Christ….even to the extent of enduring great privations, freedom and suffering. For Christ through his example of perfect obedience to the Father - he showed that his motivation to come to earth was to do his Father’s will……even to death on the cross. In our recent study of David (Bishop Barron) I came across King David who surprisingly spoke like Christ when he said, “I desire to do Your will, O God; Your law is within my heart….” - that was his motivation so that even when he sinned he repented and so still remain the “man after God’s own heart”! He never doubted God’s love for him. I believe that if our heart never doubt God’s love for us, we will be motivated and remain motivated.